You may not even know it, but you have likely seen photos of a Masai warrior. They are tall and lanky, usually dressed in bright red cloth and lots of beads. Few Western people would fail to recognize the jumping dance of the Masai warrior, where the men leap into the air to prove their strength. 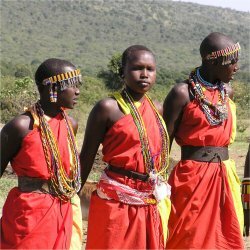 The Masai are a semi-nomadic people who travel over great portions of their territory, herding the cattle that are the center of their economy. 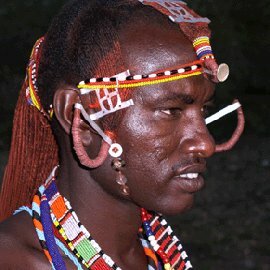 The society of the Masai people is defined by age groups or sets, especially among the men. The groups are young boys, junior warriors, senior warriors, junior elders and senior elders. Men don't move from one stage to the next at any one exact age. They shift in groups, usually every 15 years or so. When the tribe decides to create a new warrior group, all the groups shift to their next role. So when boys are initiated into warriors, the previous generation of warriors become the new junior elders, and so on. Boys get to be boys until they are somewhere between 12 and 25, when they go through the painful rituals of circumcision to become junior Masai warriors. Then they live apart from the village for several months, for training and further ceremonies. They continue to live in their own camps for up to 10 years, at which point them become senior warriors. The mothers of the junior warriors will shave their sons heads, to mark their graduation to senior status. That's when they get to return to the main village and take a wife. A warrior may take more than one wife, providing he has the wealth to support them. By wealth, I mean herds of cattle. However, the women of the tribe are also free to sleep with other men, providing they are within the same age set as their husband. If she gets pregnant, any child are claimed by her husband. One of the traditional accomplishments of a warrior, often performed as part of one of the many coming-of-age ceremonies, is the killing of a lion with only a spear. As lions can easily kill and devour a human, you can imagine how dangerous this is. This was how a junior warrior proved his ultimate manhood and the right to become a senior warrior. But in modern times, this practice has become illegal due to the threatened status of the lion populations in the Kenya and Tanzania regions.